There is an eerie absence of noise in the room next to ours. Blossom is gone. She brought friends last night to help fetch and carry, take apart and load up; removing all evidence that she lived and slept in the room next door. She left with fierce hugs, exacting promises I will be round to her new house for a cuppa in the immediate future. There was heaviness of heart on my part, and I saw it on her own face, yet - she has grown out of her child-life and yearns for her adult life. It was evident by the things she left behind to discard or pass along to her nephews, that childhood days have severed their hold. Mr E sent us separate texts from the mine, but all with the same message, "Good night everyone. I love you." And so she begins the next chapter. Tomorrow I'll do this all again with Sam. The thing about closing chapters and beginning new ones is that often there is a sticking point that simply won't let you move forward. As silly as it sounds, this has happened to me with the design process of the next 'big' Elefantz quilt design. It's in my head, and some on paper, yet I have not been able to get any further than that. A huge mental block just sits in my mind ignoring all attempts to upend it. And then a memory of something Blossom said (on a number of occasions) this year. "You have to remake 'Shabby Roses' and 'A Christmas Story', mum...you can't just NOT have them here! They are a part of you." Wise words; and that is why I haven't been able to move on. As you know I've been in the process of remaking Shabby Roses for many, many months, and have now finished all the blocks - done in brighter Tilda fabrics - but I was putting off 'A Christmas Story' because I wanted to do a new Christmas themed quilt in shabby roses before this very Christmas. Ha! Not to be. The colours are much softer this time round because I decided to use my very loved scraps of "Aviary". I am just praying I have enough of it to do the whole quilt. For sure there will be exact cutting with barely a thread to spare, but the Lord can multiply and I pray He allows me to get by on this one. The piecing is now complete on a quilt version of my "Give Thanks" blocks. I've used eight of the mini-quilt designs, and added a new Give Thanks block to the mix. The fabric line is "Sweet Broderie" - very pretty indeed. It is only 28 hours until I send out the next issue of Elefantz HOME magazine. If you'd like to subscribe for this bumper 6-design Christmas Issue, you'll need to do so by midnight today (28th). Subscribe HERE or by clicking the button on my left hand sidebar. I have dust to remove, a floor to polish, and a cuppa with Blossom to look forward to. Jen, I have tears in my eyes at your post.. Life does move on, but it is hard when babies leave the nest.. then you had to go and mention Mr E's text!!!! Love your new quilt with 'Give Thanks'..
A new 'phase' in this journey we call life is upon you sweetie. Grab it with both hands and make the most of it 'cos it only happens once. Before you know it both will be back, the house will be full - maybe only for a short time but long enough for you to value the space they have left around you and your time to contemplate where to from here. I am feeling for you so much. My baby is 16 1/2 and I am fretting his departure already. Sometimes I hope the economy keeps him around longer, but I know that is unfair. Your quilts are looking gorgeous as always. I enjoyed reading your post. It reminded me of the goodbyes we have said to each of our children and they began a new chapter in their lives. Your quilts will be beautiful, I can see that already. Looking forward to the next issue of your magazine. I'm new to your site but I just have to tell you.....I love reading your blogs. Each one is like a beautiful little story. I don't know you but from your stories I can tell that you're a wonderful wife and mother. Bless you and yours. Tears in my eyes as I remember my own journey into the 'empty nest' phase. Dear Jenny, with Hubby working away, and with the two "little ones" moving out, I know you will feel some loneliness. But please look for the rainbow, find some positiveness. Less cooking to do? Less cleaning? More time for designing and sewing and YOU? I hope so. Hi Yenny! I understand very well, my three children were at a very empty and left the nest, but it is their lives, not ours, only happiness I always ask for them. I send you all my love and will soon return Mr E and it will be easier! I dread the day you are having, though I have a few years yet before my son will move out...I cherish each day with him as I know you did your Blossom...you've had a rough month, and in spite of that you have continued to design wonderful things for all of us. I'm sending you a huge hug from 1/2 a world away! Oh Jenny.......how young Blossom is! Your nest will be so quiet but maybe those darling grandsons will come to fill your home with noise and the sound of munching cookies. I do have to tell you that I celebrated my nest becoming empty but it was after I had written the last college tuition check and mailed the wedding invitations.....life is good and I enjoy each day. Yes it is hard when one's babies are gone, but it is part of life and one can be so thankful that one's lovely children are entering adult life with a good up-bringing. Congratulations on this new phase of your life. Hi Jen Just because the children have left the nest dont fret.Mine have been gone for years but I see them more now than I did when they lived at home so keep your chin up. It is a new era for you too,now that Blossom flew the coop you have a lot more time on your hand. And I bet you will use it for your fabric creations. You will get used to it and in the end you will even like it. It really hits home when the rooms are empty. On the other hand, it is a big thing for Blossom and Sam to be starting out on their own. I'm sure they will both be asking for your advice and help along the way. I bet blossom will be looking forward to getting things "just so" for when you visit for your first cuppa in her new home. Your remakes are looking just lovely, as is your new Give Thanks quilt. I'm looking forward to receiving my next edition of your magazine. This is so hard for you. I bawled like a baby the first time my daughter and I moved apart from one another. Thankfully we are now only 2 hours apart rather than 6, cuz the 6 killed us. BIG HUGE HUGS to you!!! I felt as you do when our daughter moved to Australia (of all places!) Yet I am so proud of her independence and desire to not follow the easy road as I saw so many of her friends doing. I understand your pain, and much like grieving, it will pass with time. And with God by your side, you know the way will be as smooth as possible. I'm feeling terribly guilty about owning "A Christmas Story." I wish I could help you make the new one. Prayers are with you. OH, I feel your sadness. But God has a plan for you all. Hugs to you Jenny. I know exactly how you feel. But they do stay connected and visit and brings hugs and smiles and love. Gosh, growing up is not only hard for the kids but the parents too! I thought I was all done growing up!! 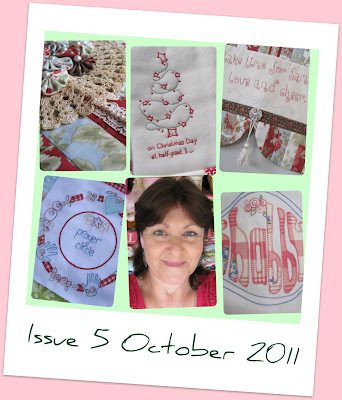 Love the new quilt and the post ....Love it! I'm sorry girl, but all I can think of when I look at that floor is that you now have a sewing room with air conditioning. Of COURSE I'm praying for Blossom, and for you - I'm awfully glad they'll both be close by! This is a new adventure for all of you. Your new quilts look spectacular, I really love the new colors. Interesting about the block...having a bit of one myself, you've given me something to think about! Love ya girl! It is so hard when the first chick leaves the nest! I cried for days & then every time they came home for a visit,I was renowned for crying when they left again! However,it is a new exciting chapter in your life & you will eventually be able to smile about it all. Loved the new edition of Home,just gets better!! Oh Jen what a sweet post, it certainly brought tears to my eyes! Love everything you make, as always! Love your post, and the newest magazine edition. I think of each one as one of your "babies" and since I just love babies, I cherish each one. That "block" will go, along with the grief that surrounds us each time a new change in our life occurs that just doesn't sit well with us. Christmas Story is looking gorgeous, and I know Blossom will be very proud of you when she sees the first remake and then the second. I'm looking forward to it, too. Mr E should be home soon, I think, if he hasn't gotten there already. You can both go and visit Blossom and Sam together. I have a feeling you'll be hearing from them more than ever, they're missing you as much as you are missing them. Love, Hugs, and blessings to all. Blossom has turned into such a beautiful young lady and it's so nice that she likes her job. Keeping busy does help and I know it's hard going at times. Perhaps your children 'need' a new quilt?